Welcome to Evolution Tungsten! Our goal is to provide you with the best tools to catch fish. We use the highest quality components in every product we produce. We are tournament anglers and weekend warriors, just like yourselves, and we believe using the best tools for the job will help you get one more fish in the boat or catch that personal best of your dreams. We evolved based on the need for lighter, higher sensitivity rods for our own tournament fishing. From there we started to find other things to improve on to help us catch more fish. Being an avid flipper and pitcher, Tungsten Weights and punch skirts were next in our evolution. Why not combine the two, and eliminate the issues with line fray and mushroomed punch skirt keepers! 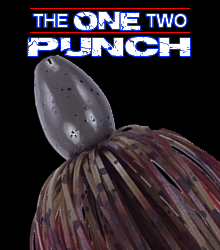 The One-Two Punch was born for that purpose. We found the heavier weights punch through cover with ease and offer the bulk those big fish under the mats are looking for. The lighter weights actually excel in light cover areas where a jig may hang up. For deep water applications, we developed a Tungsten Football Jig in all the same popular colors as our Punch weights. Football jigs have been catching fish for years, but forging this jig completely out of Tungsten has taken it to a whole new level. We are continually looking for ways to improve the way we fish, and we hope you join us in evolving to the next level!